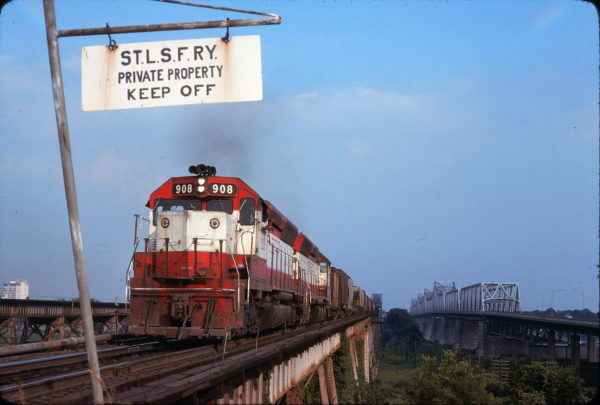 SD45 908 at West Memphis, Arkansas on May 29, 1977 (James Claflin). 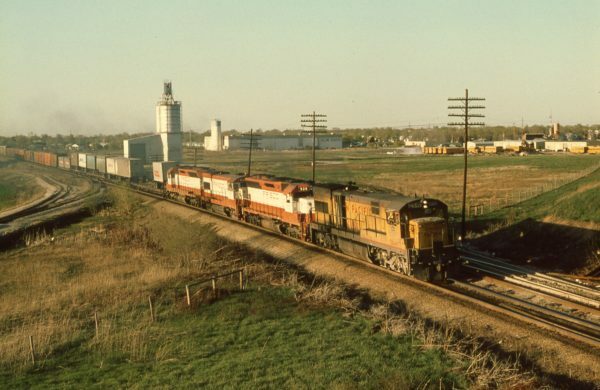 UP U30C 2846 SD45 928, U30B 852 and SD45 908 at Olathe, Kansas in April 1979 (Trackside Slides). SD45s 908 and 913 at St. Louis, Missouri in June 1973. The locomotives are on the west side of the diesel shop at Lindenwood Yard. 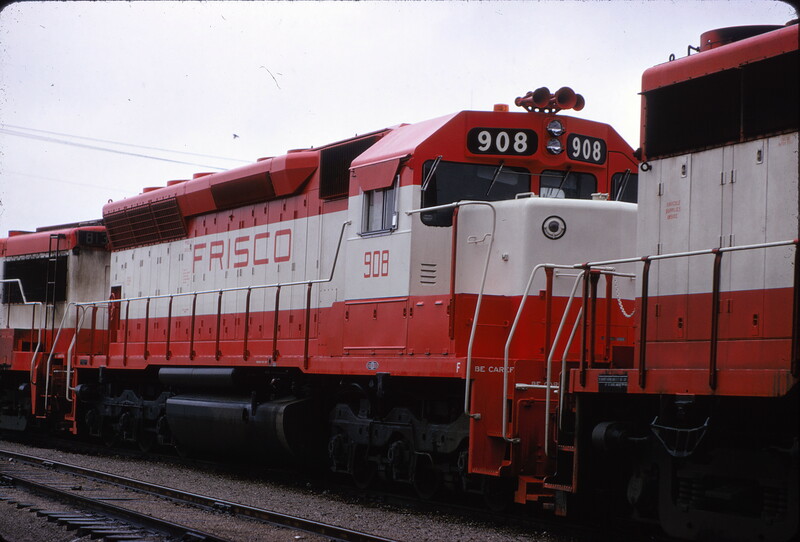 They are sitting on Shop Track 1. This is the southern most of four tracks that enter the shop. It is late afternoon in early summer just before sunset. 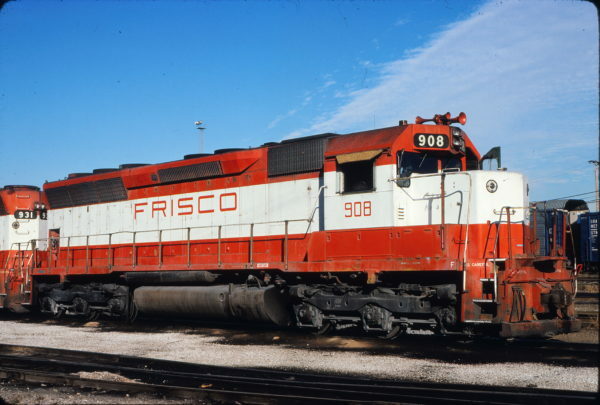 SD45 908 at Oklahoma City, Oklahoma. 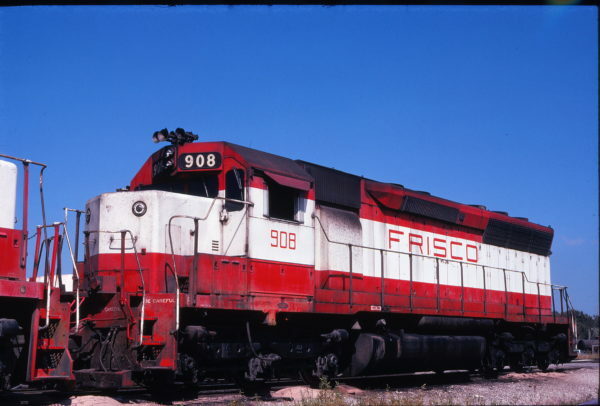 The train is westbound of the Chickasha Subdivision. It has just departed East Yard and crossed the North Canadian River. The roadway in front of the locomotives is South Santa Fe Street. 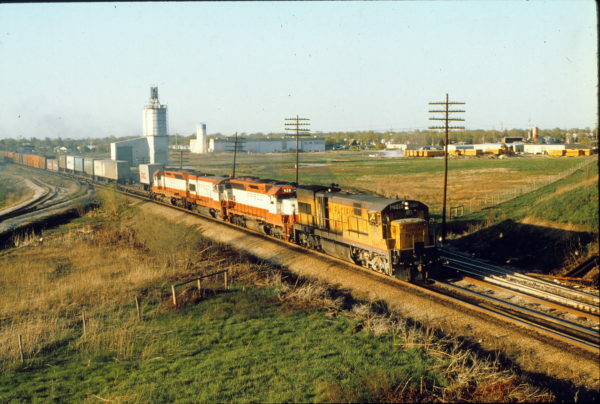 Beyond the street the train will pass under the North/South Santa Fe Railroad mainline. Just to the west beyond the underpass is the joint Frisco/Rock Island Oklahoma City Union Depot. The photographer is standing on the rise for the Santa Fe main tracks. This elevated grade separation was constructed to the east of the downtown business district in the early 1930s. Eight blocks North is the Santa Fe’s (now Amtrak) depot. SD45 908 at Kansas City, Missouri on May 25, 1974 (James Primm II). 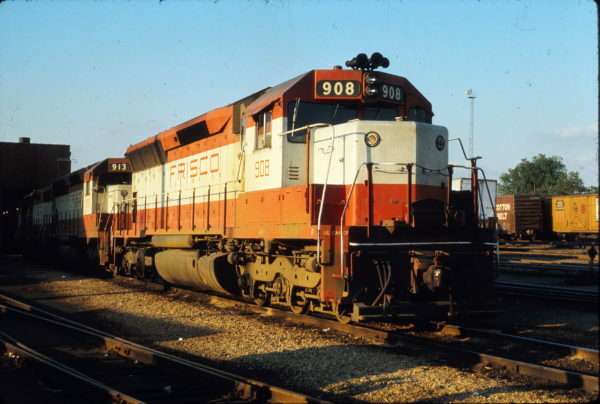 SD45 908 at St. Louis, Missouri on October 18, 1980 (Michael Wise). 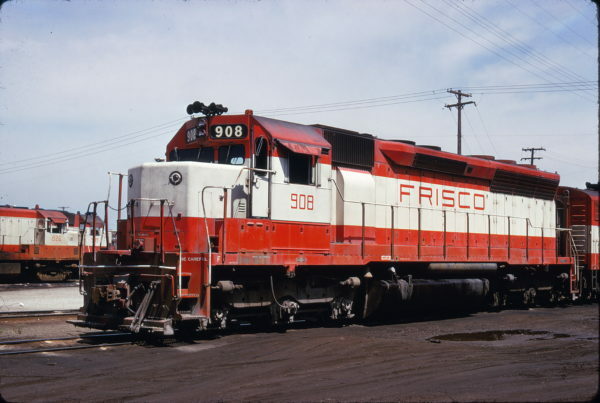 SD45 908 (location unknown) in April 1967. 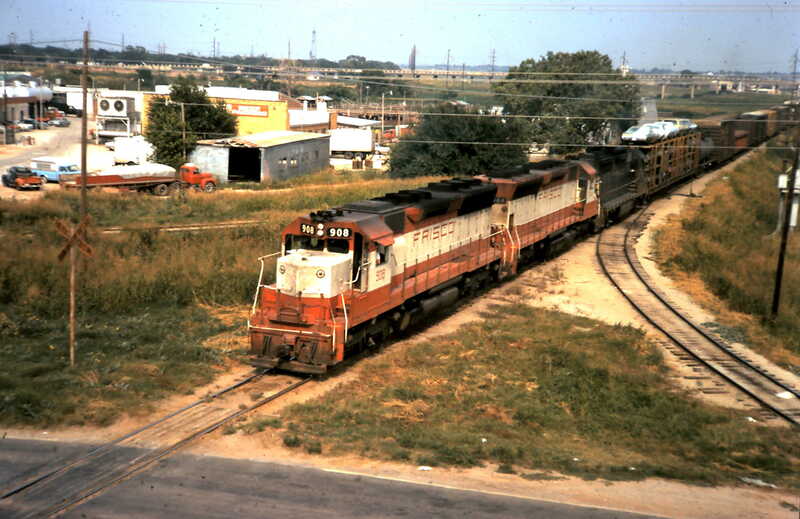 SD45 908 at Springfield, Missouri in September 1978. 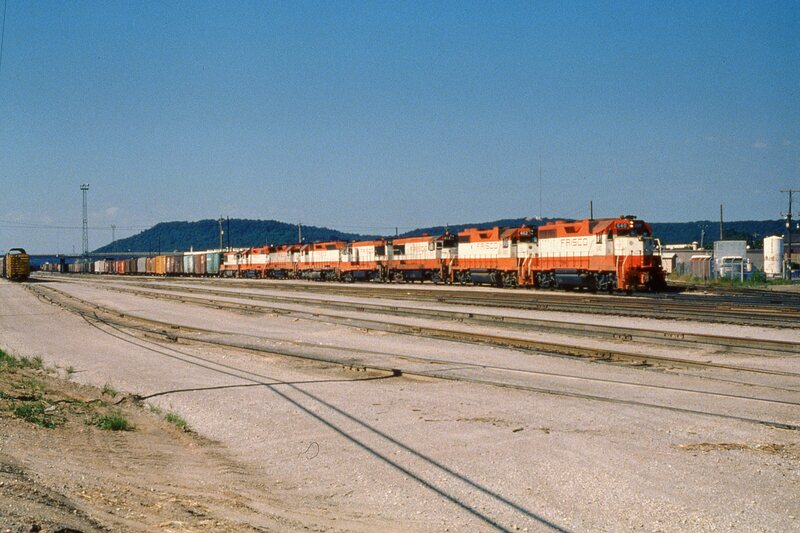 GP38AC 640, GP38-2 462, U25Bs 813 and 827, SD45s 908 and 946, GP38-2 427, and U25B 816 at Tulsa, Oklahoma on July 4, 1979. SD45 928, U30B 852 and SD45 908 at Olathe, Kansas on April 21, 1979. UP 2846 is a U30C.